Sarah Ockler delivers another stellar performance with her latest YA contemporary, The Summer of Chasing Mermaids. She out does herself on the richness and authenticity with this particular story. I felt myself completely connected to the characters and its setting. In true Ockler fashion, she makes it difficult to look away until you've reached that final page -- only to find yourself flipping back to the front, wanting to revisit it all over again. Elyse's character is someone who will definitely stand out in my mind for many books to come. I wasn't sure how I would respond to a character that was mute, but I found myself truly connecting with her despite these obstacles. Her voice spoke volumes through her actions, as well as her inner dialogue. Her pain played a key role in propelling the story forward, as well as a catalyst for the amount of personal growth she endures. I always gravitate towards stories in a beach-side setting, but this one felt very unique on the Oregon coast. I really loved the attention to detail that Ockler gave the landscape and how it interacted with the characters themselves. Even though Elyse's character carved out a place inside my heart, I've also made room for Christian as well. His own hardships slowly presented themselves, but never took away from Elyse's story. These two characters molded into a beautiful story, complimenting one another, even at their most difficult times. 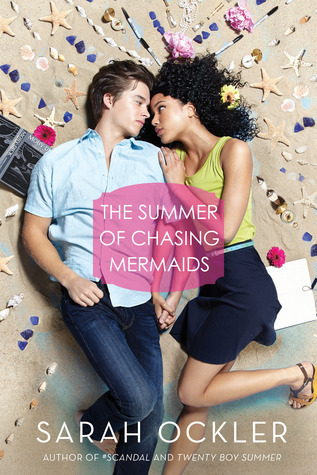 The Summer of Chasing Mermaids tells a story about second chances, and facing fears. It dig deeps with emotion, creating a bold portrait in hues of forgiveness and humility. I have strong feelings that I'll be recommending this Ockler book, along with her backlist, for years to come. I loved The Summer of Chasing Mermaids! There was something utterly magical about Ockler's storytelling in this novel, and I just fell fast and hard for it. It was really cool to see how she drew inspiration from The Little Mermaid in a couple of ways too! I can't wait to read this one. And isn't the cover awesome!?!? Lovely review, G! I liked this book a lot too. It took me a little bit of time to get used to the rhythm of the story, but eventually I was sucked in. I really admired the MC and her courage. And, yes, the setting was fantastic!